The Brandenburg African Company was created around 1680 and its flag was white, with the red eagle of Brandenburg topped with the electoral cap and the shield of Electoral Brandenburg [blue shield with the Reichserbkämmerer's golden scepter] on her breast. The sword and the sceptre were gold and crossed behind the eagle. On 8 January 1701, Frederick III issued a decree following which the ships of the Company had to fly the white flag with the black eagle of Prussia with a royal crown over her head, the letters "FR" [Fredericus Rex] on her breast and a ducal crown around her neck. Later (1707) the ducal crown was substituted by a royal one. An exact design of this flag is not known. This [latter] flag was the very first flag with the black eagle of Prussia. The Brandenburg African Company ran in the late 17th and early 18th century a strongpoint on the Gold Coast called Gross Friedrichsburg. It sold its colony to the Dutch West Indies Company (GWC) in 1717. Under the reign of the Grand Elector Friedrich-Wilhelm von Brandenburg, was created an African Company, this company for about forty years ruled on several African forts at: Arguin, Takrama, Takoradi, Akwida (Ft. Dorothea), Whydah and Princestown or Poquefoe (Gross-Friedrichsburg). On 1 January 1683, a Brandenburger expedition of two ships, arrived in the Gold Coast, and started to build a strong fort between Axim and Cape of Three Points, which was named Gross-Friedrichsburg. The fort was to be the headquarters of Brandenburg in Africa, it was garrisoned at the beginning by 91 European men and 130 Africans. The fort was a square shaped with four bastions. In the first 15 years the Brandenburgers developed well the trade with the Africans, but from 1700 trade began to decline. The Company was allied to an African chief called John Couny that was in war against the Dutch and the English. In 1720 a treaty was concluded between the King of Prussia and the Dutch, and all the African forts of Brandenburg were sold to the Hollanders, but the African ally of Prussia/Brandenburg, John Couny, refused to surrender Gross-Friedrichsburg. In 1725 the Dutch captured Fort Gross-Friedrichsburg and renamed it Fort Hollandia. The fort was abandoned by the Dutch in 1815. A white flag with a black two-headed eagle with a gold crown and gold sword and scepter. The worst of them is that I have not been able to find any other reference to the Brandenburg West Indies Company or the Brandenburg East Indies Company. 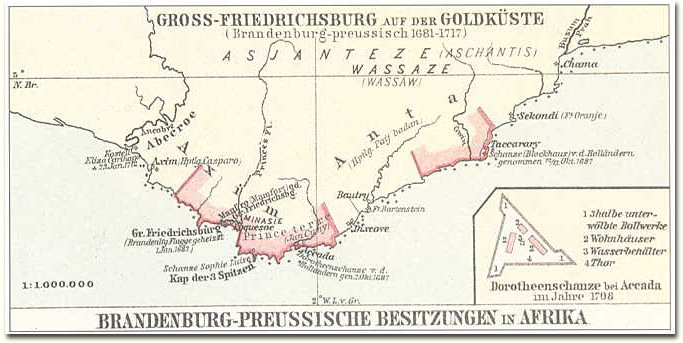 There was in the late 17th and early 18th century a Brandenburg African Company which ran a strongpoint on the Gold Coast (called I think Gross Friedrichsburg) and which participated in the slave trade with the West Indies. It sold its colony to the Dutch West Indies Company (GWC) in 1717 (incidentally 20 years before the first of these flag listings). A second problem is that the flag illustrated has a two headed eagle, unlike any other Brandenburg eagle. Indeed the representation is, except for a difference in the crown, exactly like a 1700 flag of the Emperor. The two objections (supported in part by the fact that the ships and colony had been sold to the Dutch West Indies Company) are reason enough to regard this flag as doubtful. Perhaps one of our German members might be able to find out whether there were in fact any other Brandenburg trading companies, other than the African one. Brandenburg flags [have] a red one-headed eagle, Prussian flags a black one-headed eagle. The flag looks more like an Imperial or else a Russian flag. [My] image [above] is according [to] Flagmaster. The German editors of Norie and Hobbs 1971 added two charts (which were not originally in Norie and Hobbs 1848) with German flags that were important over time. One of them is no. 14, Brandenburg West-Ind. Cie., as the above flag, except no shield and cloverstalks, the eagle all black, holding a sword and a scepter and crowned by a crown wide enough to rest on both heads, all yellow.